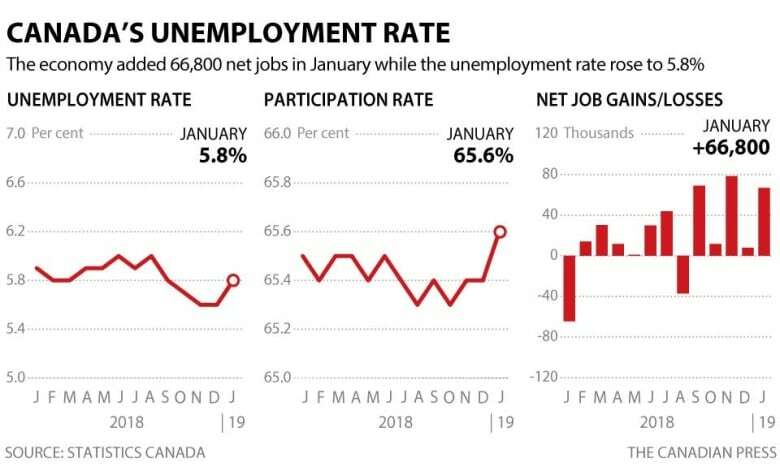 Canada saw a rush of 66,800 net new jobs in January, fuelled by a hiring surge in the private sector, but Statistics Canada also says more people searched for work last month, which pushed the unemployment rate to 5.8 per cent from its 43-year low of 5.6 per cent in December. The country saw a rush of 66,800 net new jobs in January, fuelled by a hiring surge in the private sector, Statistics Canada said Friday. The agency's latest labour force survey said more people also searched for work last month, which pushed the unemployment rate to 5.8 per cent from its 43-year low of 5.6 per cent in December. Economists had expected the addition of 8,000 jobs and an unemployment rate of 5.7 per cent, according to Thomson Reuters Eikon. 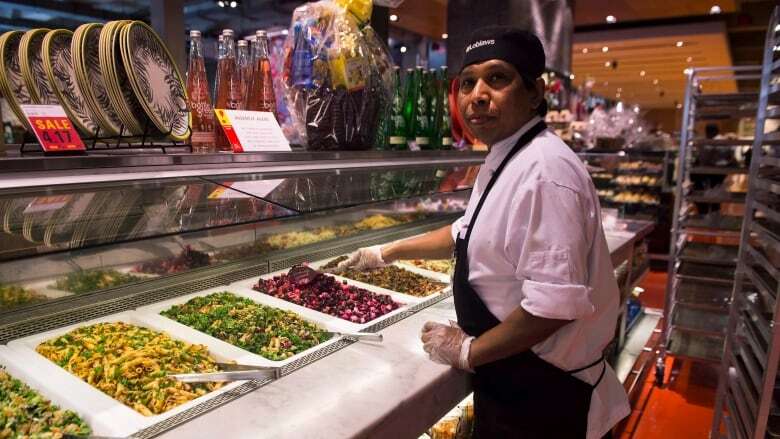 Only the accommodation and food sectors of the service industry saw a decline between December and January, but compared to January 2018, employment in accommodation and food services was relatively unchanged. Employment rose by 29,000 jobs in professional, scientific and technical services. Jobs in public administration increased by 21,000, led by gains in Ontario and Quebec. Year-over-year average hourly wage growth in January for permanent employees was 1.8 per cent, up from December's reading of 1.5 per cent, but still well below its May peak of 3.9 per cent. The numbers Friday also showed that, year over year, the number of employee hours worked were up 1.2 per cent compared to 0.9 per cent in December. More young Canadians, between ages 15 and 24 years, also found work last month as youth employment gained 52,800 positions. The youth jobless rate edged up to 11.2 per cent, from 11.1 per cent in December as more young people looked for work. "The labour force participation rate among those under 25 jumped up, reversing a decline over the second half of last year," said Brendon Bernard, economist at employment search engine Indeed Canada. "The weak situation for youth was one of the negative points of the 2018 labour market. While one month of data shouldn't get us too excited, it's good to see this year start off on the right track." Derek Holt, head of capital markets economics for Scotiabank, said in a written statement that the Friday job numbers "blew away expectations for Canadian labour markets to ring in the new year." But more useful than any monthly jump is the larger picture view, he said. "Over the past year, Canada has grown 327,000 new jobs. Since an inflection point in mid-2016, once the economy was adjusting to the much more serious and longer lived commodity shock in 2014-15, Canada has grown about 900,000 jobs — 75 per cent of which have been full time." Holt also pointed out that consensus forecasting of job growth has been routinely underestimating labour market growth, missing more than "60 per cent of the cumulative job gains produced in the Canadian economy over the past three years." While the unemployment rate averaged 5.8 per cent nationally last month, there was significant variation in joblessness from province to province.